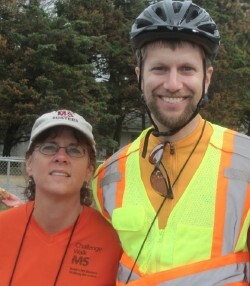 MS Challenge Walker Leslie Baldi and bicycle support crewperson Ken Gagne are co-workers at IDG. The company's internal publication, IDG World Update, recently featured the two's efforts to find a cure for multiple sclerosis. This story by editor David Bromley from the July 23, 2012 issue (Volume 42, Number 27, Page 5) was distributed to the organization's 9,000 employees and is republished here with permission. Click here for the original PDF. Two Framingham, Mass.-based IDG employees are walking the walk — literally. Computerworld Senior Associate Online Editor Ken Gagne and IDG Corporate Services Group Senior Accountant Leslie Baldi have raised money for and walked the annual Massachusetts Multiple Sclerosis Challenge Walk a collective 18 times. Baldi's husband Tom was diagnosed with MS in August 2003, just days before his 40th birthday. "I felt so powerless to help my husband until I learned about the MS Challenge Walk," Baldi said. "I have always been a fast walker so I finally felt like there was something I could do to help." She has participated in the three-day, 50-mile Walk on Cape Cod every year since — on Team Baldi's MS Busters, which is largely made up of siblings and friends of the Baldis — raising more than $125,000. "I personally feel like I am walking for the people who can no longer walk and to help raise awareness about the disease," Baldi said. "The walk is a very emotional event for us, but it renews our spirits each year and gives us so much hope that there will be a cure someday. We feel like the people involved in the MS Challenge Walk are our extended family." IDG Corporate Services Group Senior Accountant Leslie Baldi and Computerworld Senior Associate Online Editor Ken Gagne at the 2011 MS Challenge Walk. Since 2003 the Baldis have participated in or volunteered at numerous events for the National MS Society. 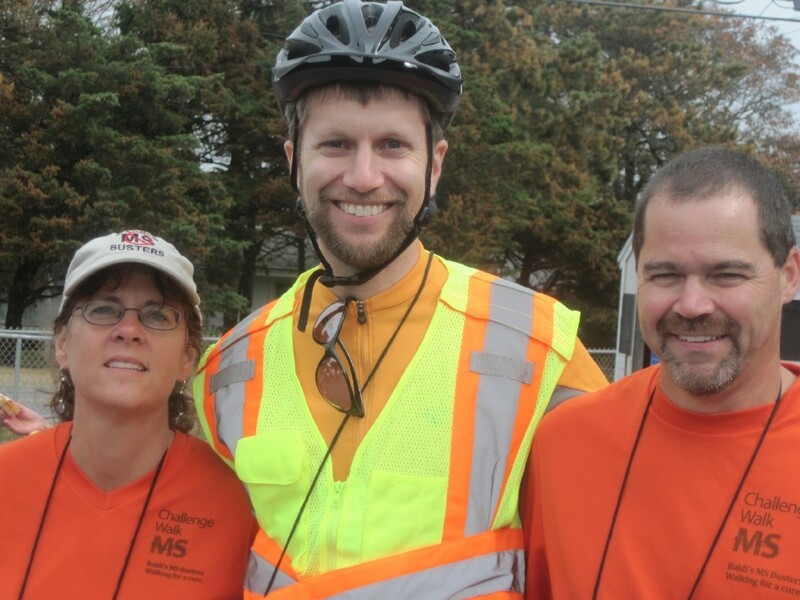 Baldi has provided bike support at the MS Journey Walk for a number of years, and she and her husband volunteer at other one-day walk or bike events. She also completed the 150-mile Cape Cod Getaway bike event in 2007 and 2008 for the MS Society. "We have to thank so many of our friends and co-workers at IDG who have been supporting us for the past six years," she added. Gagne said that at a job prior to coming to Computerworld, a co-worker asked him to donate to her MS walk. "I wrote a check and didn't think about it again until a month later, when it hit me, 'Wait a minute — my mom has MS. Why aren't I the one walking?'" With less than two months to train and fundraise, he joined his co-worker's team. Since that first walk in 2005 he has raised more than $30,000. After participating in three Walks, Gagne switched to the bicycle support team, riding alongside the 600 walkers and providing them with food, drink, basic first aid and encouragement. "I usually ride near the back of the pack, since those are the walkers who often need the most support, emotional or otherwise," he said. "It's good for morale to let them know they're not alone, and as bike support I get to see everyone and participate in the entire community." Gagne has been on the Walk's steering committee since 2008 and also manages the Walk's Facebook page and curates a Walk blog and podcast of Walk stories and advice. "I enjoy knowing that I can contribute my skills to an organization that may not otherwise have the time or resources to investigate such opportunities," he said. "Although podcasting has been around since 2004, it's not a medium any of the National MS Society's 60-plus chapters were currently employing, which is one reason I pursued it: I knew we would be unique." This year's Walk will be held Sept. 7-9; more information is available here. To support Team Baldi, click here; to support Gagne, click here. Ken joined the MS Challenge Walk in 2005, more than a decade after his mother was diagnosed. After walking for three years and 150 miles, he switched to the support crew and now rides his bicycle along the trail, providing whatever encouragement (and snacks!) he can to the 600 walkers. He is also an alumnus of the event's steering committee and is this site's webmaster. Add your fundraiser or training event to our calendar! Sign up to receive Challenge Blog posts via email!